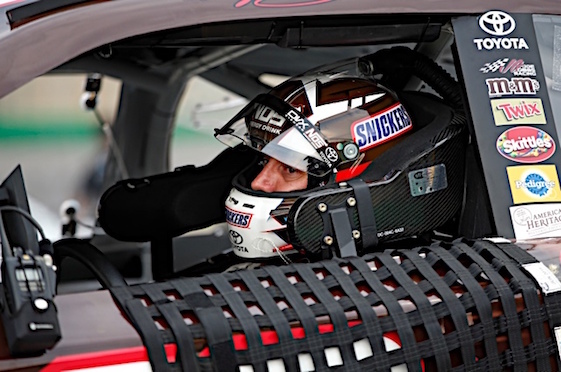 Kyle Busch started Sunday’s Cup race from the pole. Busch toured the 2.45-mile/11-turn natural-terrain layout in 69.490-seconds and 126.925 mph to pace a field of 12 Monster Energy NASCAR Cup Series drivers competing in second-round qualifications. Busch, driver of the No. 18 M&M’s Caramel Toyota Camry fielded by Joe Gibbs Racing, will be joined on the two-car front row by Kyle Larson of Chip Ganassi Racing after his hot lap of 69.862-seconds/126.249 mph in the No. 42 Credit One Bank Chevrolet SS. NBC Sports Group and Motor Racing Network are partnering to present live Cup race coverage starting at 3 p.m. (EDT) on NBC Sports Network. Similar to the collaboration between NBC Sports Group and MRN for Saturday’s Xfinity Series telecast, the Cup event will be called from multiple vantage points around the historic Finger Lakes course. Earlier Sunday, WGI President Michael Printup announced that reserved grandstand tickets here were sold-out for the third consecutive year. Busch checked-off another career box Saturday afternoon by claiming his first NASCAR Xfinity Series victory at WGI in the Zippo 200 at The Glen. With three laps remaining, Busch used a great restart to hold off fellow-Cup Series regulars Joey Logano and Penske Racing teammate Brad Keselowski to post his fourth NXS victory of the season. Busch, who led 43 of 80 laps Saturday, said a sweep in the 90-lap/220.5-miler is a definite possibility. “It certainly is,” said Busch, who earned his third consecutive pole, second in 13 races at WGI and 25th in 448 Cup starts. “Our cars have been really fast this weekend. I don’t know if I’m just in the groove or what, but it feels pretty good. The cars have really been working for me here and it just feels so good to finally win an Xfinity race here. We’ve been so close so many times. Cup point-leader Martin Truex Jr. will start third after a lap at 125.783 mph in his No. 78 Furniture Row/Denver Mattress Toyota. Chase Elliott will start fourth after lapping at 125.584 mph in the No. 24 SunEnergy 1 Chevrolet SS fielded by Hendrick Motorsports. Rookie Daniel Suarez, of JGR, rounded-out the top five at 125.543 mph in the No. 19 STANLEY Camry. Cup superstar Dale Earnhardt Jr., who is retiring at season’s end, will make his 17th start at WGI from the 28th position in the field of 37. Junior was eliminated in Round 1 after a lap at 123.457 mph in the No. 88 Axalta Chevy SS fielded by Hendrick Motosports.